If you’re from Vancouver or you’ve taken the skytrain at some point, you’ll get Millennial Line’s punny name. 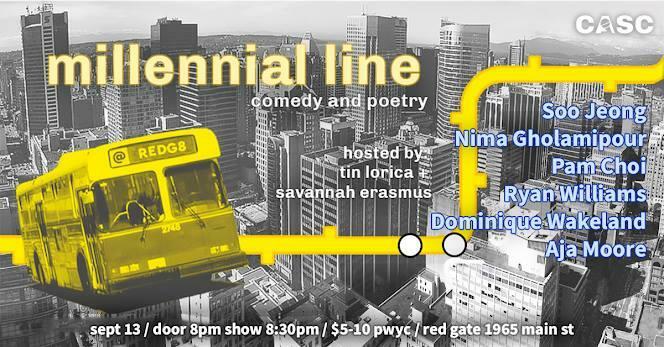 Created by hosts and performers Savannah Erasmus and Tin Lorica, Millennial Line is an affordable show with a diverse lineup of funny poets, depressed comics, and everyone in between. With the show hosted at the intimate Red Gate (1965 Main St.) just off the 99 B-line, I caught the third instalment of the event before they go bimonthly in the fall. Stepping into Red Gate is like stepping into a secret party where everybody is friendly. On one side was a stage with a projector showing loops of Skytrain footage and tweets from the performers. Instead of chairs for the audience, several small couches were gathered for the occasion. The night started with Erasmus and Lorica introducing us to the show’s celebration of young, queer, people of colour voices in the local scene. Their banter wasn’t the polished ramblings you can expect at a comedy club but rather that of two friends, full of quippy references, slight teasing and even a few awkward pauses. The show began and everyone in the lineup had something different to offer. From professionals Soo Jeong and Ryan Williams showing us the ropes, to newer voices Nima Gholamipour and Pam Choi, to our hosts, the performers hit on all the hot millennial topics: Tinder, seasonal/year round depression and being broke, before laughing it all off. While admittedly I came for the comedy, what really made Millennial Line special was the poetry. Dominique Wakeland woke the audience up with poems of their intimate exploits and black girl magic. But without a doubt, headliner Aja Moore was the highlight of the evening, sharing work from her debut collection of poetry, hotwheel. Simultaneously sweet and sincere, as well as heartbreaking and hilarious, Aja was a great closer to a lovely evening. If you’re looking for a lowkey event with a lot of heart and laughs, look no further than Millennial Line.